We offer fire extinguisher training to citizens in the community. This involves a hands on opportunity to use a fire extinguisher to put out a small controlled fire and to gain experience in its use. 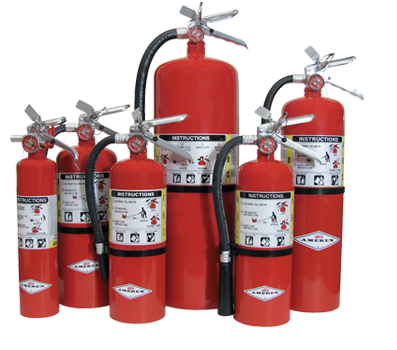 We offer training on when to use, how to use, and what type of fire extinguisher to use for specific fires. Our staff will come to your place of business, show a brief video, and explain the differences in extinguishers. Following the classroom portion, the students will go outside and put out "flammable liquid fires" using extinguishers just like the ones at your place of business. • Use a portable fire extinguisher when the fire is confined to a small area, such as a wastebasket, and is not growing; everyone has exited the building; the fire department has been called or is being called; and the room is not filled with smoke. - Pull the pin. Hold the extinguisher with the nozzle pointing away from you, and release the locking mechanism. • For the home, select a multi-purpose extinguisher (can be used on all types of home fires) that is large enough to put out a small fire, but not so heavy as to be difficult to handle. • Choose a fire extinguisher that carries the label of an independent testing laboratory. • Read the instructions that come with the fire extinguisher and become familiar with its parts and operation before a fire breaks out. Local fire departments or fire equipment distributors often offer hands-on fire extinguisher trainings. • Install fire extinguishers close to an exit and keep your back to a clear exit when you use the device so you can make an easy escape if the fire cannot be controlled. If the room fills with smoke, leave immediately. • Know when to go. Fire extinguishers are one element of a fire response plan, but the primary element is safe escape. Every household should have a HOME FIRE ESCAPE PLAN and working smoke alarms.